"SER-BI-JA! ", shouted one side of the south grandstand. "KO-SO-VO! ", shouted the other. Back and forth they went with this chant as the microscopic Albanian contingent of no more than a dozen on the other end of the stadium made their best attempts to whistle their displeasure. Even Guilherme and Corluka walked towards the home fans and motioned at them to stop their taunts. 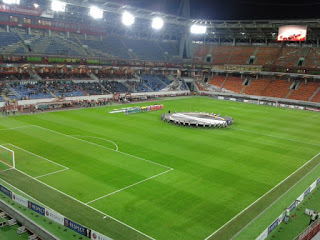 The stadium announcer loudly stated in Russian and in English, "We kindly ask you to refrain from political statements." As European nights returned to Cherkizovo, politics played a major role. Russia's brotherhood and support of Serbia is well-documented and any match versus an Albanian team is apparently a tailor-made situation to voice their strong opinions. The worst part of it was yet to come though. Directly below me in sector 6 were four Albanian fans, two men and two women, sitting in the Loko part of the stadium and holding up a pair of Albanian flags. Considering the circumstances, this was idiotic on their part, but certainly not wrong. I sensed trouble and it came. Two men came rushing towards them and didn't attack them, but wrestled away their Albanian flags and dashed off before security could stop them as the fans of the south sector howled and cheered. 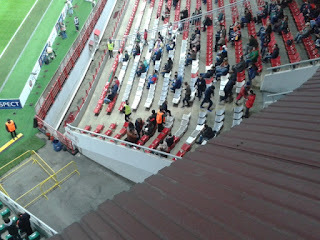 The Albanians were then escorted out of their seats and taken into the Skenderbeu sector. Politics and sports don't mix and while a stadium may be a good place to visually display your alliances, it's against the nature of what is happening on the pitch. This is a sad part of the Russian game and it only hurts the innocent people that only want to watch a nice football match. I have plenty of my own political opinions too and I'm happy to discuss them from time to time, but you'll never hear me breathe a word of it at Cherkizovo or any other sporting venue. It's neither the time nor the place. Security, in orange, escorts Albanian fans out of the Loko sector. It wasn't a memorable night as far as fan behavior was concerned, but it has to be said that all fans did not participate in this. Regarding the match, Loko rolled to a relatively easy victory, even without Kasaev and Denisov who were sat to rest minor injuries. It's the kind of win that good teams get and that Loko would have drawn 0-0 or lost last year. 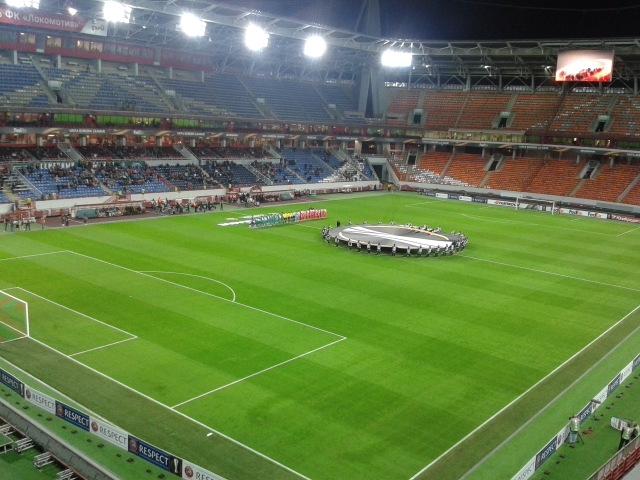 After CSKA, playing an unfancied Albanian side was a notable drop off emotionally, but the team stayed just focused enough to cruise to victory against inferior opposition. An announced attendance of 10,300 turned out, but in reality it looked like 6,000-7,000 on this cool, autumn evening. Loko controlled the first half. Maicon almost headed in a a goal after only minutes. Soon after though, Skenderbeu would have their best chance of the half as a corner found and open Albanian player in front of the goal, but he harmlessly kicked it over bar. Niasse opened up the match in the 35th minute when he headed home a perfect Yanbaev cross to make it 1-0 for the Railwaymen. The second half was also dominated by Loko, though they only managed one goal in the 73rd minute when a long pass into the penalty box from Logashov was headed by the defender directly back to Samedov whose shot found the back of the net and gave Loko an unassailable 2-0 lead. Loko had plenty of other chances to add to that and Miranchuk, who came on as a halftime substitute, looked particularly dynamic and almost produced some of his Messi-like Russian Cup final magic and Guilherme made an amazing save while running after being out of position, but the result was never really in doubt. The win, coupled with the 1-1 draw between Besiktas and Sporting in Turkey, puts Loko on top of the group with 6 points. We're sitting pretty, but there's still a lot of work to do though this team has proven yet again that the sky's the limit. But let's only talk about football from now on. 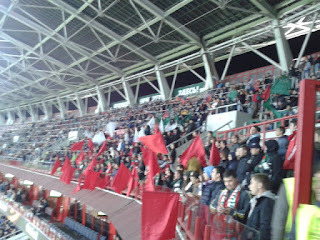 Actually there was more than one dozen of Skenderbeu fans that night. I counted about 20 of them in VIP-1 zone drinking vodka with beer. They looked like being just back from the Red Square all dressed in shapkas with Soviet symbolics and showing each other pins with pioneer and communist matras. Our Albanians replied with very loud whistles to each chant from the fans stand but shouted nothing in response.